Origin’s LaTeX App is a great way to add equations to graphs. As I detailed in Origin LaTeX App: Under the Hood, the App utilizes MiKTeX as the typesetting engine involved in generating equations that are placed on graphs. In the process of generating an equation, MiKTeX and the LaTeX App itself must create a number of temporary files. These files are saved in a directory typically located on your hard drive at C:\Users\username\AppData\Local\OriginLab\93\TMP\textemp (where username is your actual user name and 93 means Origin 2016. For upcoming Origin 2017, it would be 94). Very occasionally, you may run into an instance where the App may begin to have issues generating output with markup that is known to usually work correctly. When this happens, you may need to perform a little housekeeping by deleting the files in the temporary folder. Also over time, files can build up in the folder and you may want to remove them in order to recover the hard disk space they use. In this blog post, I will show you how to delete these files. Deleting the files will have no adverse effect on your existing LaTeX equations and also will not effect future usage of the App. Note: If you don’t feel comfortable navigating your file system or deleting files, you should probably not continue. If you are currently running Origin, exit (close) all running instances of the application. 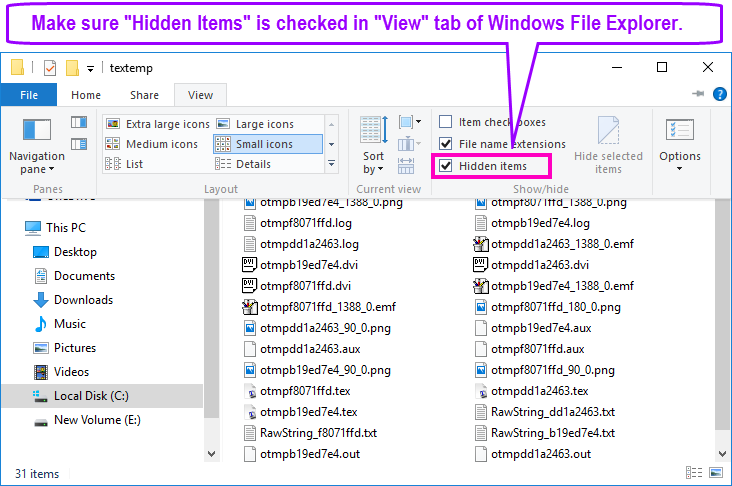 First you need to enable viewing “Hidden items” in Windows File Explorer by selecting the “View” tab in File Explorer and checking the “Hidden items” control. For Windows 8-10, see Figure 1 below. For Windows 7, please see this reference. 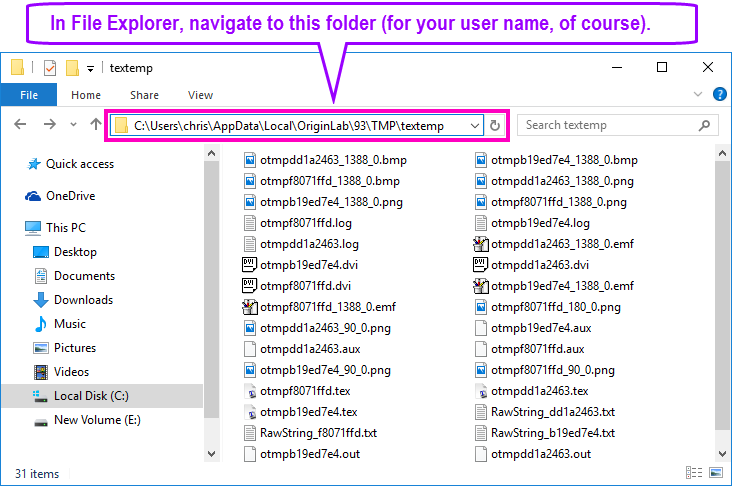 Now in File Explorer, navigate to the C:\Users\username\AppData\Local\OriginLab\93\TMP\textemp folder (again where username is your user name and 93 means Origin 2016. For upcoming Origin 2017, it would be 94). See Figure 2 below. Once you have navigated to the textemp folder in File Explorer, select all files in the folder by first selecting one file and then using the CTRL+A keyboard shortcut (see Figure 3 below). Be careful that you only select files in the textemp folder and not the folder itself or other files outside the folder! 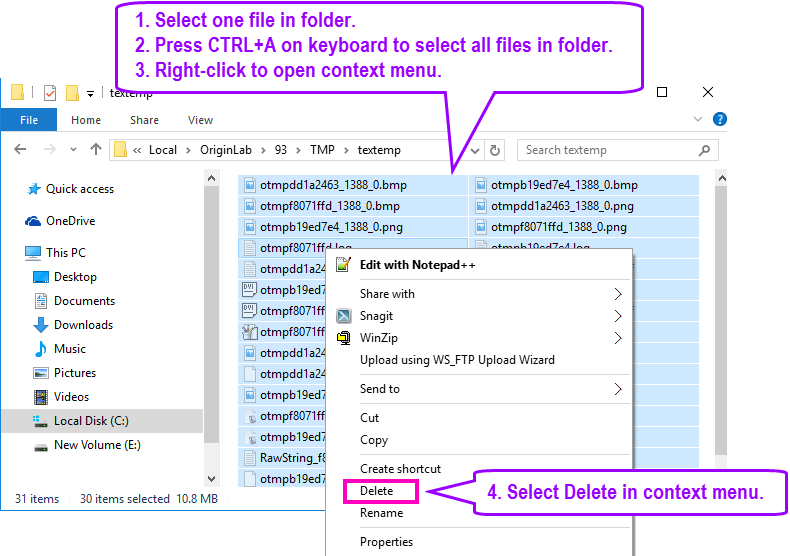 Next, right-click to open the context menu and select “Delete” to delete all of the selected files. That’s all there is to it. This simple housekeeping step does not need to be performed frequently. It really only needs to be done if the LaTeX App begins to have issues with output when using markup that is known to usually work correctly. However, it is also useful to run if you want to recover the hard disk space that MiKTeX and the App have used over an extended period of time.